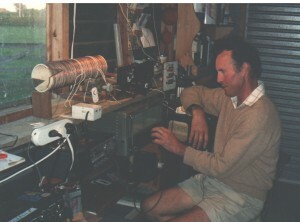 ROBINS CHAMBERS’ ANTENNA DOMAIN – THE CHAMBERS BROS.FARM. LOCATION: Near Opunake which is approx. 1/2 an hour’s drive NW of Hawera. Travel North-west through Opunake on State Highway 45 (better known as (Surf Highway) a half mile and turn left head for the Mountain on Te Namu Road (Namu means Sandfly).It’s 1.5 miles to the farm entry on the right. The Homestead is a 1/2 mile back from the road set among trees & bush. 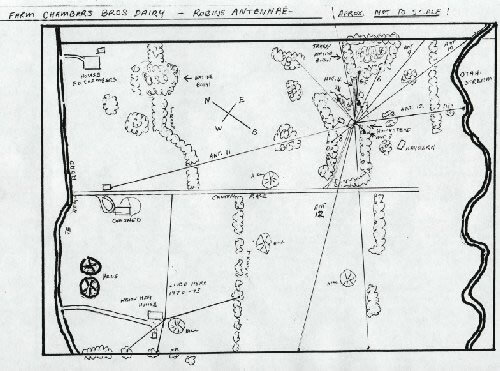 209 acres of land for antennas! In the early days much of the land was covered in gorse. It was also very wet and swampy. The land above swamp level consisted of rocky hills! The slopes between rocky hills and swamp contained deposits of iron-sand. It took over 26 miles of stoned in & tiled drains to get it anything like dry. Possibly the drainage may have been detrimental to reception. 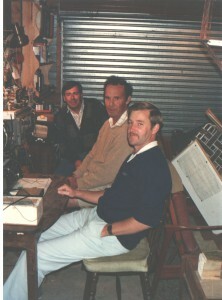 My interest in DX was aroused when I met up with Bill Woller and Ted Manning of the NZ DX Radio Assn. The year was 1953.My first antenna was about 15 metres of wire up the nearest tree (about 10 metres high).My first receiver was a regenerative 1 valve Hikers One which I built under the guidance of radio man Charlie Yep. 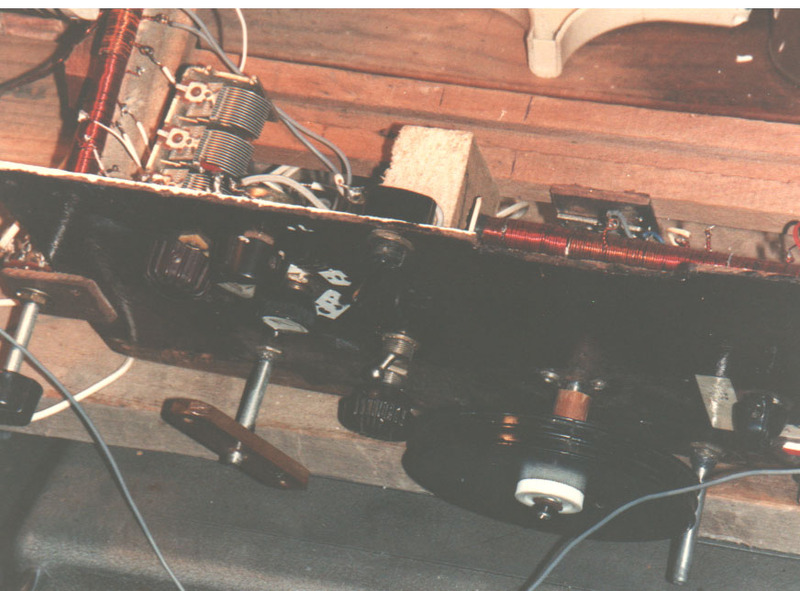 Humble beginnings but this set gave reception of Australia/NZ, many Asians and even picked up Cairo(620kHz),WLAC(1510kHz) and Monte Carlo(1466kHz). DX went a stage further with Dad’s 5 valve (superset) Kitset Receiver. I clearly remember hearing Peking(640kHz) at 11.00PM. Also Fiji (930 kHz) until s/off with Isa Lei. Wonderful Fijian voices. 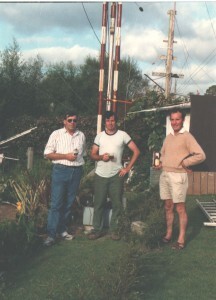 ANTENNA 2: Year 1954.Ran a 65 metre wire Northeast to the top of an 25 metre pine tree. Straight toward North America. I was advised to run an antenna towards the area I wished to receive but North America it would not have! It favoured Northwest to West to Southwest. Soon had large col1ection of Aussie QSL’ s.
ANTENNA 3: Later, 1954. South backlobe – dimensions as last antenna. Pick-up lobe Hawaii round to Japan. Broader on lower frequencies. Above 1200kHz it picked up strongly round to Japan but rejected China. ANTENNA 4: 1955. Erected 3 wires fanned out between Northeast and East and each wire taken directly to ground at the far end. Length 120 metres. At the receiving end the wires were commoned to a single lead-in. Height approx. 6 metres. Good low angle pick-up from Hawaii-U.S.-Mexico but signal levels a bit low. 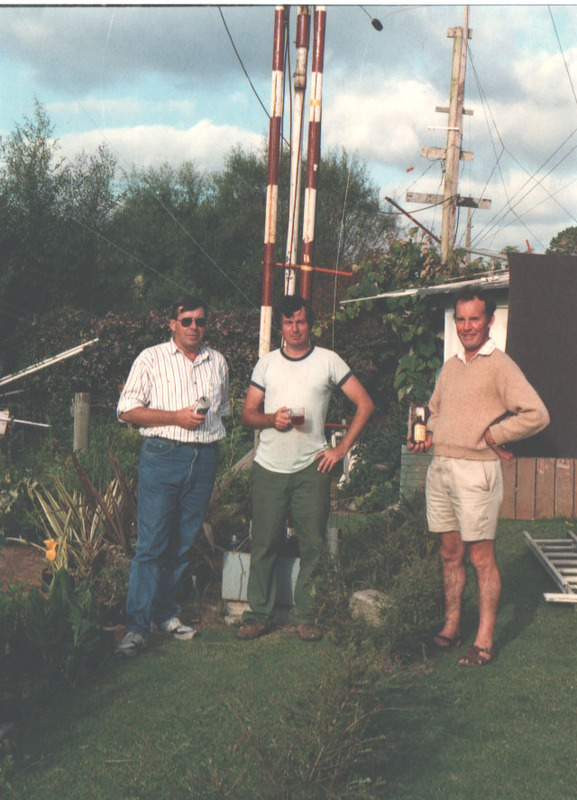 Soon found that when this antenna was combined with the South backlobe there was a great signal lift from not only the States but also round to South America & Portugal The South antenna was connected to the receiver Aerial Terminal and the radials to Earth or AE terminal. At this point I opted for a better receiver – an old Gulbransen. With this antenna set-up, amassed a lot of U.S. Central/East Coast DX. But soon a better still receiver was in the offing – the Radel DX Broadcast 12.Much more selective & heaps of grunt. ANTENNA 5 1958-60. East-Northeast backlobe 150 metres long between 2 pine trees, average height 15-20 metres. Gave brilliant reception from Western Australia, Algeria, Libya, Egypt, France, Spain. Now using a Hammarlund H2.129.X receiver. ANTENNA 6 Another big backlobe. This time East South-East 200 metres long,15-20m.high. In February/March Aussie signals would peak around 2.00-3.00PM quite strongly but were very disturbed, fluttery signals. ANTENA 8 1959. West backlobe 50-60 metres long. Resonance middle of band. Good for Portugal long path, also Latins. ANTENNA 9 1973-76.Receiver:Eddystone 680X. East Beverage 400 metres long. Terminated 560 ohms. A great antenna for Portugal, Spain, West Africa, even heard U.K! Antenna average height 5-6 metres. ANTENNA 10. Southeast Beverage, 750 Metres long on poles & trees 2 metres above ground. Great for most of South America. ANTENNA 12 Beverage bit over 500 metres long same height as above. Angle 150 deg. true. Guessed aiming the antenna a bit East of South America might discourage signals from Peru, Colombia etc. It worked and how: Brazil, Uruguay etc. were fantastic. Colombia, Peru, Venezuela, Ecuador non-existent. By this time I was also using a National DR31 as the Eddystone was ailing & not holding its alignment and the audio was crook when filters were needed. Except the notch filter which is excellent for 1kHz splits. Well that’s the end of an era. When we left the property noise problems were much on the increase. Higher voltage power lines in the area & salt spray don’t go well together. And the modern way of stock control – the electric fence barrage. ANTENNAS 3 & 4 This set-up was a great stand-by and was in use a long time. Northern Europe in the mornings. Some highlights: 1439 kHz R. Luxembourg 150kW 19.12.57. Nurnburg Net Germany (1602kHz) 40kW 31 .3.57.Frederickstad,Norway(1578) 9.4.59. 3 & 4 Combined: WKMF Flint, Michigan (1470 kHz) 5kW s/on 1000 24.7.59.KLPM Minot, North Dakota (1kW) 1029-1035 15.8.59. WROX Clarksdale, Mississippi(l450kHz) 0.25kW 0624-0730 6.3.61. That master shows how it is done! 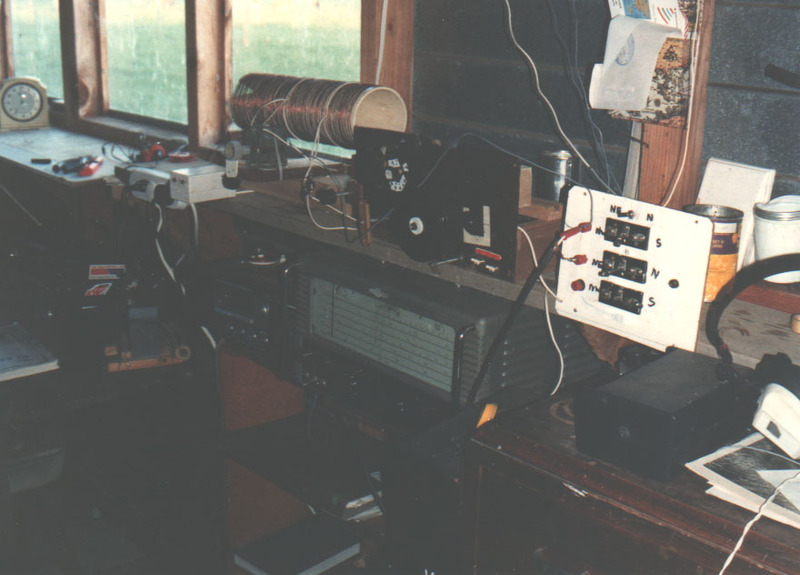 Aden Broadcasting Svce., Aden (800kHz) 5kW 1820-1845 9.4,58. F.B.S. Nicosia, Cyprus (1439kHz) 7.5kW 1749-1815 20.3.60. Benghazi, Libya (1484kHz) 10kW 1822-1900 22.4.61. OAX1C R.Delcar, Peru (l520kHz) 1kw 30.4.63. HCQB1 R. Nac. 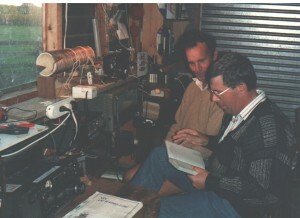 Espejo, Ecuador (1310kHz) 10kW 0643-07020.10.84. OAX4M R. Atalaya, Peru. 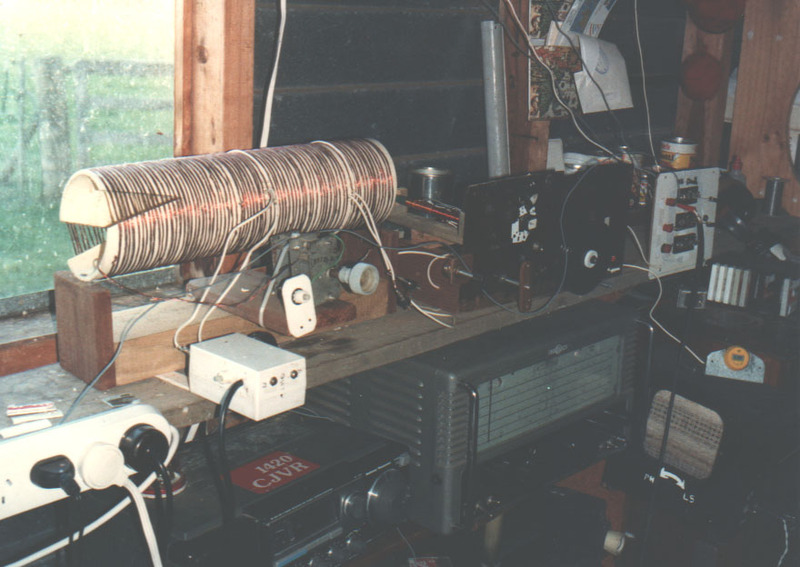 (l300kHz) 1kW. 0453-0510. 30.5.82. S.Salvador, Portugal (1062) 100kW 0608-0620 14.9.84. ANTENNA 12 East-Southeast Beverage 150 deg. true. R .Renascenca ,Muge ,Portugal (594kHz) 100kW 0538-0606 13.4.85. Madrid, Spain (585kHz) 100kW 0658-0733 7.4.85. R.Fenix,CX40,Uruguay(l330kHz)5kW 19.5.86 0430-0545 19.5 .86. Canary Is(621kHz) 100kW 0541-0611 23.4.86. ZYJ464 R. Bandeirantes (1360kHz) 50kW 0452-0540 29.4.86. ZYJ754 R. Guaruja (1420kHz) 5kW. 0836-0930 29.4.86. 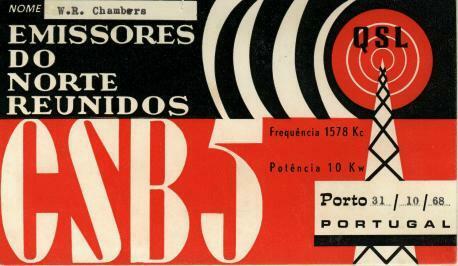 One that got away was CX160 Radio Fortaleza, Montevideo, Uruguay on 1599kHz with 250 watts logged 0532-0545 on the 13.6.77. Alas no reply! ANTENNA 12 West Beverage. 450 metres long, 8 metres high. Harrar, Ethiopia peaking over Russian station.1743-1816 9.4.77. 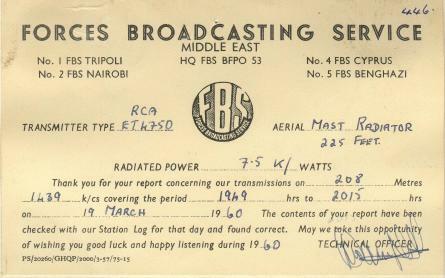 Asmara, Ethiopia (944kHz) 1840 Fair-Good 4.6.77. Sudan testing. (1295kHz) Many songs in English 1838-1912 20.6.77. Nairobi, Kenya(611kHz) in Swahili Fair 1905 16.8.78. Reunion in French (729 kHz) Good 1805-1833 24.3.81. Seychelles (1368 kHz) Good in FF 1700-1720 18.3.83. 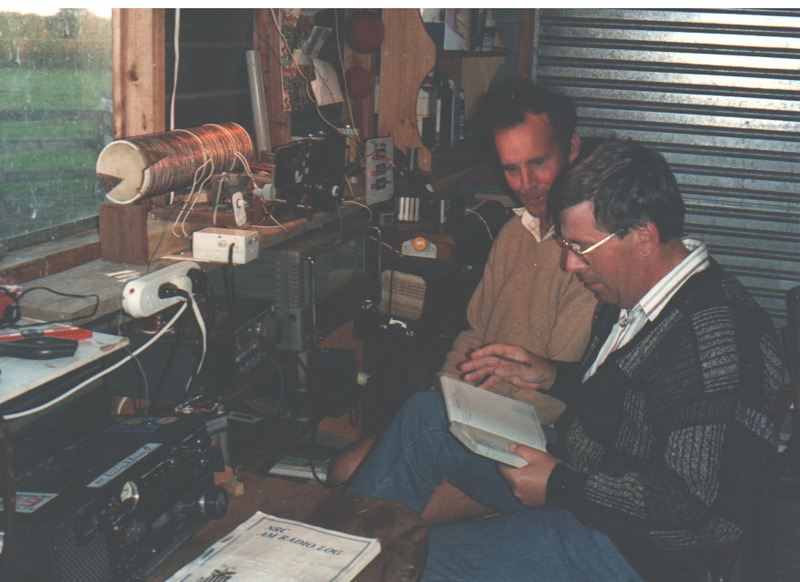 Brunei Broadcast Service 1240kHz 20kW aired a DX Special for the NZDXRA arranged by Ted Manning, New Plymouth.1430-1530 UTC. 30.5.59. Their signal was fair with some reasonable peaks. Copy was sufficient, though difficult, for verification. The Chief Engineer Mr. A. T. Dunk was sorry to learn that reception was unsatisfactory. KATB Agana, Guam 570kHz 5kW logged on 25.4.79 1145-1201AM.Heard to announce at midnight -“Rock Music at midnight – that was 1969 – you’re listening to KATB, Guam” – that was a tough one. Had to take measures to knock 2YA (567) really hard. But they had some peaks that were good enough. Cook Is. 630 kHz 5kW.A really tough one! 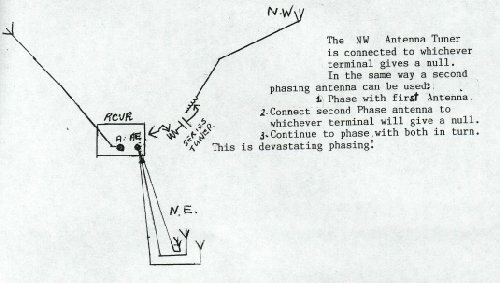 But finally got them on 6th Aug.1985.Used an inverted V antenna aimed NE over a high tree as an element for cardioid with a loop antenna. Did you know that it is possible to null in two directions with such a set-up? Well it is and the nulls are steerable. That’s a long story for now. Anyway successfully nulled 2YZ Napier as well as an Aussie on the frequency. and they came thru for a pretty good report. Papua-New Guinea: Logged Wewak of National Broadcasting Commission of P.N.G. on 1 July,1974. l520kHz,2kW. Time 1330 to s/off 1400.They were pleased to verify – so says Allen Hull, Director of Programmes. and P.S. “We apologise of being delayed response, to the fact we were not organised, due to our changes and formed new Broadcasting Organisation. THANKYO.” !! My notes say their signal was weak to Fair. New Plymouth for the NZRDXL. Power 500 watts. Sunday 27.7.58 at 1315 UTC. Signal at good level but much Static that morning. Port Moresby NBC 585kHz 2kW 0903-0920 20.2.79. Very good signal most nights. B/cast in EE News. Roll of drums, then adverts. followed by discussion on narcotics till 0920. Triadic Array aerial system. Australian Broadcasting Commission card. 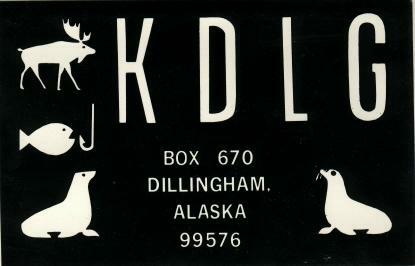 I see you heard WKMF 1470 back in your winter of 1959. Very impressive. Did you hear WMBD frequently? I suspect that WMBD may have been off the air for maintenance or regular schedule since it is on Central Time and WKMF is on Eastern Time. Art Vuolo, the person they call Radio’s Best Friend, said that someone heard WSDS 1480 when it was a 500 watt daytimer back during that era in that region of the world. Was that you also? They signed on in 1962.